Human beings cannot see very well at night due to dark conditions. We all know this fact very well. But, what if they could observe their surrounding in low-light situations? What about hunting at night? Pondering how? Getting a best night vision rifle scope can help. There are a few situations where people need to see things clearly at night too. What could be these situations? It might involve hunting or serious military operation. Sailors, pilots, soldiers and many other professionals need to observe things at night. How can they see clearly at night? They need a pair of night vision scope for this. It is a technology that aims to provide visibility in dark surroundings. It helps in adding some enhancement to the regular vision of a person in dark situations. Now, to get night vision, you need to buy a night vision scope, which is an instrument that you can attach to your rifle. It is comprised of multicoated lenses and technologies. These techniques assist in delivering massive light to a person. Want to know further about this tool? Scroll down for more! Night Vision vs. Thermal Scope: Which should I choose? First of all, we will discuss the working of a night vision scope. This is helpful so that you can select the right tool for yourself if you know how it works. Night vision devices that contain Starlight technology are comprised of many different parts. They contain an eyepiece, an objective lens, an image intensifier tube, and a power source. Image intensifier tube is actually a vacuum tube that contains photocathode. The basic working of this device is to illuminate the area you need to observe and for this, it will need some light source. Furthermore, night vision devices use the light coming from the surrounding environment. It may involve moonlight, starlight, or infrared light. It collects this light with the help of its front lens. Moreover, these light particles, which are actually photons, enter the photocathode tube. Here, this tube converts them into electrons. After that, this device faces chemical or electric procedure that magnifies these electrons. Now the electrons that are much greater than their original number strike against the phosphorus screen. This process changes them into visible light. You can see this light with the help of your eyepiece. How about the image? You can see it more clearly, magnified in a green hue. There are different types of night vision devices available in the market. These types are monoculars, goggles, binoculars, scopes, and day/night systems. The selection of the right night vision device is very important. It will eventually affect your experience of using night vision devices in the long run. Night vision monoculars are a night vision device for a single eye. You can attach this compact sized device with your compatible rifle, camera, or on any other weapon. Furthermore, if you become successful in purchasing good-quality monoculars, it will advance all other night vision devices because of its versatility and lightweight body. The major benefit of this device is that you can switch it between both your eyes. In this way, you won’t feel tired of using a single eye all the time. Also, your free eye will maintain the night adaption where the monocular eye will see the intensified image. Furthermore, it is lightweight and easy to carry. Night vision goggles are a night vision device with which you can see with both your eyes. You normally mount this device over your head and it gives quite a natural feeling of seeing. You won’t need long to be able to see perfectly with this device. The major benefit of this device over the monocular is its better depth perception and it provides improved navigation. These night vision binoculars contain two eyepieces for each eye. This attribute is similar to the goggles, yet the difference is these binoculars are too heavy to mount over your head. This tool assists in the magnification of distant objects while remaining motionless. This tool is also best for providing highly magnified images along with the close-up view perspective. You can attach the night vision scopes onto your weapon. It then provides night vision to you while you hold your weapon. The major benefit of this device is its ease-of-use. Also, a good-quality scope provides excellent performance in long-range images. This day/night device comes with multiple uses. You can either attach it to your regular daylight scope or put it over your rifle at the front of daylight scope. They work along with daylight scope to magnify. This device is best to use when you are looking for a single device that can serve both at day and at night. In order to get a better idea about choosing the right device, we need to know the differences first. 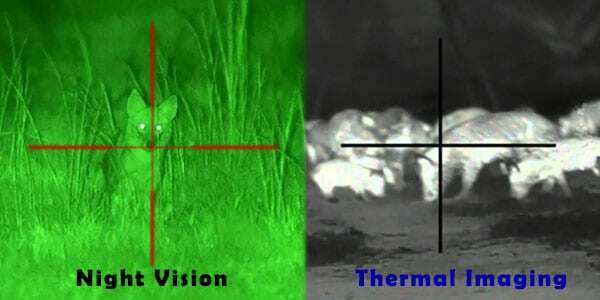 What is the difference between night vision and thermal scope? Though they serve the same purpose, their working mechanism is different. Night vision scope makes use of surrounding lights. No matter, how little it will be, your device will amplify it and make the image clearer for you. Furthermore, you can use night scope in very low light situations, however, if there is no light source at all your night vision is not going to work. Now, let’s move to the thermal scope. As its name indicates, it makes use of the thermal energy or radiations emitting from bodies. If there is anybody present in your neighboring area, the thermal scope will detect it. It will use heat waves emitting from their bodies for detection. Now, it doesn’t matter if you can or cannot get any light source from your environment, your device is going to illuminate the target object. Nonetheless, this is the basic difference between both device types. If you feel uncertain about a selection, then let us explain to you the facts. Selection of either night vision or thermal scope depends completely on your choice. In short, your night vision device is preferable for low light, extremely cold, and low-budget conditions. But, the thermal scope will particularly assist you in no light scenarios. In the past, the functioning of thermal scopes did not hit the mark. People considered them less durable as compared to their competitor. But now, they give an equally durable performance as night vision scopes. There are basically two types of night vision scopes. The difference exists in their way of use. Weapon sight is the most famous type of scope. It looks similar to a standard rifle scope. The only difference is in its size because it is comparatively more bulky and larger. These are specific devices. They give an outstanding performance as compared to day/night systems. We attach these types of scopes at the front of a standard rifle scope. These devices are known as day/night because at daytime you can detach this device and can just use the regular scope. There are four generations of night vision scopes. Of course, the latest generations are always more advanced and more expensive too. Here, we will briefly discuss the four generation levels of this device. Back in the 1960s, the technology wasn’t advanced enough to create a fully clear image. The images were sharp in the middle and blurry from corners. Due to its limitations, it is not suitable for professionals or high-risk tasks. Its shortcomings involve shorter ranges, low battery life, small field of view, low image resolutions and others. However, this tool is still useful for the common huntsman, and for those looking for the budget-friendly device. The second generation scope gives more distant object coverage as compared to the previous version because of its micro-channel plate that intensifies the image. Furthermore, it gives a comparatively sharper and brighter image. Regarding its performance, this generation has a lot closer performance to the generation 3 scopes. But, there is something you should know about this generation. There are different quality levels of this invention as well and it is about their tubes. CGT IIT Generation: In these scopes, producers create tubes for giving improved performance. These tubes are sensitive for the wide spectral band. This is the reason the scope gives proper contrast no matter what image it is capturing. HPT IIT Generation: These tubes are a better version of CGT tubes. They provide an even more enhanced sensitivity, resolution, and modulation transfer function, resulting in a clear and bright image. Due to these tubes, the second-generation scope’s performance matches with those of the third generation. These generation scopes are something that would be used for military purposes or for risky projects. It is a high-quality device that contains different levels of grades. However, unlike the previous generation, all the levels give exceptional performance. It has better range, battery life, low-light output, life expectancy, and versatility. In short, everything is superior as compared to older models in this generation. However, with improved features, expect higher price ranges as well. This is a completely different generation. It uses a different method for power supply instead of having film. It gives enhanced resolution and range with decreased interference. These tools are also known as filmless and gated. This night vision scope is the top night vision scope for the money. It is first generations scope that delivers a clearer and sharper image. This makes it particularly famous for night hunting. You can purchase this NV scope in black. The manufacturers have built this device with the aim of offering 3x magnification. That’s why it not only captures details of a distant object but gives precision too. Furthermore, its user-friendly attribute with efficient performance makes it one of the best night vision scopes for hunting. It comes with a sturdy body that can withstand extreme nighttime hunting. The construction of its outer structure involves tough titanium material. Due to this attribute, it protects interior parts from shocks. Night time hunting involves more wear and tear. Therefore, your device needs to be tough enough to face all factors. Firefield has made their scope capable of bearing all of this. If you want to have night vision along with strong magnification, then this device is meant for you. It comes with 3x magnifications. This means you can see a small object even with a distance of almost 100 yards. Night vision with magnification is something that makes night hunting easier. You can shoot your target without putting much strain on your eyes. This night vision scope also comes with a built-in IR illuminator. With this feature, it possesses great illumination power even in extremely dark situations. Nevertheless, this feature is what everyone looks for in an NV scope. With its infrared illuminator, you don’t need help from any other light sources. It works perfectly with other features and delivers optimum results. This is one of the major reasons behind this scope’s popularity. Besides other functional features, it also contains ergonomic design. Its lightweight body with distinctive shape makes it user-friendly. You can easily mount it or hold it in your hand without facing any inconvenience. As it comes with a titanium body, it shows great resistance towards the outdoor elements. This material makes it resistant to corrosion, high temperature, and other unfavorable conditions. It is one of the best night vision scopes with a low price range as well. Its ergonomic structure offers great ease. Its durable body can give exceptional performance even in rough circumstances. Furthermore, with its built-in IR, you can see things clearly even in very low-light conditions. The titanium body protects its inner parts in all types of situations. › What do other people think about this night vision scope? This night vision scope gives great value for your money. Under the moonlight, it delivers adequate clarity over the distance of 75 to 100 yards. Though it might not seem like a lot, this distance is perfect for night hunting at an amateur level. It is one of the best Generation 1 night scope available in the market due to its manufacturing standards that are quite high and the material used is durable. However, you should read its instructions properly. Among other Generation 1 scopes, it gives much clearer and sharper images. It is overall a good night scope for the money you pay. With its 3x magnifications, it gives a close-up image of a distant object. Its built-in IR helps in identifying an object even in extreme darkness. Its user-friendly features make things easier for beginners. Due to its ergonomic features, you can perform hunting without any trouble. Its robust body can withstand tough weather conditions. It gives enough field of view. Its magnification needs some improvement. For beginners, its quick release lever might create trouble at the start. This Firefield Rifle Scope is one of the best selling Generation 1 night vision scopes. Unlike other devices of its generation, it delivers optimum results. Great magnification, enough illumination, strong body, and many other features describe this product. However, one should choose the device according to their budget and requirements. This item is good for anyone looking for an affordable NV scope for night hunting. Interested in knowing how Firefield FF16001 NVRS Night Vision Riflescope is helping hunters in night hunting? More about Firefield Gen1 NV scope details here. Number 2 on our list is definitely a reason why we and 87% of all customers have fallen in love with these night vision scopes from ATN. Maybe it’s the 1080p resolution, or perhaps the easy ballistics calculator. We’ve all seen those extremely cheap night vision scopes on TV that look like they came from a pinhole camera. The ATN Night Vision Scope is not one of those. Furthermore, this is the best night vision rifle scope that allows you to shoot in HD. The resolution is 1080 pixels even while recording, perfect for shooting in HD. Night vision scopes would be useless if you had to do all the math yourself. Which is why we have deemed ATN as the best night vision rifle scope for hunting. Not only does it provide a high resolution, but also makes accurate calculations and allows you to get a better lock on the target. Firstly, it is able to create a “range” for the target. It identifies the height of the target and ensures that the bullet remains within that range for better accuracy. Secondly, it calculates distance and path so you can get a better idea of where the target is. Thirdly, it is able to adjust the crosshair for varying weather conditions. If it’s too windy, you can enter the speed of the wind and the crosshair will be adjusted for you! The ATN Night Vision Scope is able to magnify the target up to 20 times, allowing for easier targeting and more accuracy. If the target is close, then the naked eye can take care of it, but if it’s too far away, then the ATN Night Vision Scope has your back. The ATN Night Vision Scope Camera features a high resolution of 1080 pixels, clear and soft images, spectacular video and audio rendering. A highly professional looking design, ballistics calculator that calculates range, distance, time, elevation, slope, and direction, is compatible with smartphones and laptops, can magnify up to 20 times, and automatically adjusts the crosshair according to the weather. It comes as no surprise that the ATN Night Vision Scope has a high customer satisfaction rate. While most customers were unhappy trying out scopes from other brands, the ones who dared to try out the ATN Night Vision Scope were exceedingly happy and content. One such customer quotes that when they first tried out the scope, they didn’t think that it would work, as it was a new brand. But they swear by the name of the Apostle that the scope was pitch perfect when it arrived. HD vision with high video and photo resolution of 1080p. Calculates the distance and dimensions of the target, adjust according to the weather, makes predictions, and much more. Can magnify anywhere from 5x to 20x. Night mode quality may be less than day mode. A bit too pricey, but definitely worth the extra cash. The ATN Night Camera is the best night visions scope camera, and most of the customers recommend it. Check out the product here. We’re not wrong when we say that the Burris Prism Sight is one of the best night vision scopes for air rifle, and if you don’t believe us, believe the 89% of customers who were happy with what they received. This model features water resistances, adjustability to any sort of light, portable, an elegant design, a multi-coated lens, and much more. This night vision camera from Burris is entirely adjustable and can be optimized for any type of lighting. It features unique Ballistic/CQ lighting that illuminates the object and a reticle that adjusts itself accordingly. This is just one of the many features, but it was enough for us. Have you ever had to go home from a hunting or target ranging activity just because your scope got wet? If the answer to that is yes, then we think that the Burris Prism Sight is made for you. Not only does the body resist water damage, but the multi-coated lens is also immune to light contact with water. Let’s face it, no one wants to carry around a ten-pound camera scope on their back as well as mount it onto their rifle. The Burris Prism Sight Scope fixes this problem as it is very lightweight. Furthermore, its portability and modern design is one reason why we rank it as the top night vision scope. Glares on lenses can be a nuisance. Not only can they be annoyingly distracting, but sometimes it may actually result in a loss of property, or in serious cases, life. The Burris Prism Sight Camera Scope has a multi-coated lens which features a special formula that reduces reflections and glare while allowing for brighter images. Nonetheless, it’s all you could hope for. 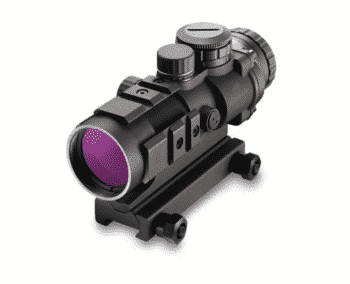 The Burris Prism Sight not only has a fancy name but a repute that can never be paralleled. Most of customers were quite unsurprisingly pretty happy with the product, and the reasons why are more than clear. Furthermore, the Burris Prism Sight Night Vision Scope features easy to use software and hardware, compatibility with iOS and Android, no less than perfect image rendering, gorgeous video, and audio compilations, lesser lens glare, portability, and much more. What can they think besides finding it exceptionally overwhelming? Users claimed that the Burris Prism Sight Night Vision was one hell of a ride, and all of these were authentic purchases. Most customers fell in love with the sleek and modern design, while others were content with the adjustability and level of customization. One customer even said that the ballistics calculator is as accurate as a machine. Resistant to water and air damage. Sleek and highly professional design. Can easily mount onto an AR15 via Picatinny Rail Mounting Bracket. Can shoot in both night mode and in broad daylight. Multi-coated lens reduces glare and enhances vision. The reticle may be offset in some cases. The Burris Prism Sight is one of the best night vision rifle scopes, and most of the customers would agree. While we have stated all that the Burris Prism Sight Night Vision Scope has to offer, we recommend to find out the latest update about the product, and take action now by pressing that “Find out“. Regardless of whether you’re a professional hunter or want to hunt alone on your property, having the capacity to see your target visibly is critical. Particularly at night. There are numerous benefits of a dependable night vision scope. For some recreational hunters, putting resources into a vision scope means paying a vast piece of earnings. Therefore, when you find a scope with quality execution without burning up all available resources is nothing but amazing. Here, we will talk about one of the best gen 2 Night vision rifle scopes under 2000. Take a look at the following features and see how you can benefit from them. The heaviness of any scope has a major effect particularly when you anticipate mounting it. The normal scope with a better than average measure of amplification weighs almost 3 pounds which influences a weapon to feel significantly heavier. On the off chance that you need to maintain a strategic distance then go for a handheld or protective cap mounted a scope. It is a basic part of any scope. With greater magnification, the scope will weigh more. This is due to the weight of additional lenses to accomplish the magnification. ATN Gen 2 has 4x magnification which is considered to be a great measure. When hunting or in the field, it is vital to realize that the gadget won’t die out. The normal battery life of a standard scope is 30 hours for 3V battery and with an IR brightness feature, it is 15 hours. This scope also has 30 hours of battery life but runs on 1 AA battery. This makes it one of the best affordable vision scopes in the market. The clearness of the object you see will is also critical. When the object is blurry then you will most likely be unable to figure out what you are pointing at. This scope has a better determination with details around 40 than 45 lp/mm. This budget-friendly tool leaves the hunter with a clear view up to a minimum of 150 yards. When you’re searching for another scope and need the best alternative for your one of a kind needs, there are a few basic things to consider i.e. lightweight, durable battery life, enhanced magnification, convenient mount choices and much more. ATN Gen 2 delivers all that in a less expensive price than most of its competitors. Users are impressed with the clarity and brightness of the ATN Gen 2 scope. Many customers believe that it exceeds the manufacturer’s claims based on its high-end features. However, they do believe it is a bit heavy to handle but overall it is the best value for money. When you are a significant distance away from the target then this 4x magnification is likely to be excellent. In comparison to most models available in the market, the weight of ATN Gen 2 is considerable light and easy to handle, therefore, it will make your weapon feel lighter as well. It is a standout amongst others night vision weapon sights. To find out more about prices and specs of ATN Gen 2+ Night Vision Weapon Sight click here. Number 5thscope on our list has a unique design to cater the needs of beginner and professional hunters. If you are in search of the best night vision rifle scope, Armasight Vampire is the right choice. Moreover, the CORE technology provides a high-quality resolution which you will find amazing. Furthermore, the item also comes with a detachable infrared illuminator, which enhances the ability of the rifle scope to locate your target even in the darkest environments. The Armasight Rifle Scope comes with a 3 times magnification, which is powerful and reliable enough for hunters to view their target. If you are planning to hunt small rabbits and turkeys with this rifle scope then this powerful magnification feature will meet your needs. The rifle scope comes with an adjustable reticle which allows you to focus on the target. You can conveniently and easily adjust the brightness of light according to your needs. Thanks to the adjustable reticle, you are able to get an optimal range you need in total darkness. Moreover, the adjustable reticle enhances your field view while aiming for your target when you are out hunting. One of the key features that make the scope stand out is its water-resistant design. Tough as it should be, this quality of being waterproof makes the scope reliable even in harsh weather conditions. If you are out hunting and it suddenly rains, this scope will continue to work. Furthermore, you will be able to view your target even when the weather is poor. In addition to being water-resistant, the scope is also fog-resistant. Therefore, you are able to have a clear vision of your prey while hunting even when the weather is foggy and unclear. If you are in search of best night vision scope under 1000, then Armasight is a great choice. You won’t have to look any further, it has all the best features you want in a night vision scope. Furthermore, it comes with a CORE technology, adjustable reticle, and a strong water-resistant design which makes it a remarkable choice. › What do other people think about this rifle scope? About a year ago, I bought this scope to hunt turkeys and pigs and I was more than happy to buy it. You are getting a perfect rifle scope for a budget-friendly price. This scope is amazing without an illuminator under a full moon and cloudless conditions. It meets my hunting needs and I could not have a better rifle scope for under 1000. Adjustable reticle with the ability to adjust the brightness of the light. Waterproof and fog-proof design prevents it from harsh weather conditions. Core technology gives it the capacity of giving high-resolution which is 60-70lp/mm. The illuminator is not good for targeting long distance prey. The scope is a bit heavy and difficult to carry. The Armasight Rifle Scope is an ideal choice for hunters who want to hunt in the darkest environments. Its core technology is the main feature which gives an image resolution of 60-70lp/mm. If you are a hunter and you are looking for the best-quality night vision scope, look no further, Find out the latest price and offers of Armasight Rifle Scope here. The Sightmark Phanton XT comes with a powerful feature of optimal magnification. For the best viewing and targeting experience, this number 6thnight vision scope comes with all the characteristics you are looking for as a hunter. The night vision scope is very lightweight and easy to handle. One of the key features of the Sightmark is the powerful and spectacular magnification ability. The magnification of 4.6X and large objective lens of 42mm allows the night vision scope to give you optimal clarity in darkest areas. Furthermore, the magnification capabilities of Sightmark Phanton XT are extraordinary and they allow you to see long distance ranges clearly. If you compare this rifle scope with other rifle scopes available on the market, you will have an idea that the scope has a sleek and very smooth design which makes it lightweight and easy to carry. This night vision scope comes with a video output feature, which allows the hunter to make a video of his target. This is a very distinguishing quality of this night vision scope which makes it stand out from the rest of the scopes available in the market. Whether you are shooting a target in the daylight or at night, you can easily capture the video of anything with this feature. Another important key feature which makes this night vision scope unique is the multiple reticle styles it provides. It has six digital reticles styles which allow the shooting enthusiast to focus on the target objectively. Moreover, the different reticles give you an option of targeting your prey accurately and efficiently. The Sightmark Vision Scope is top-of-the-line night vision scope that has all the features and specifications a hunter is looking for. The device works well even in dim and low light conditions. You can use this scope during the daytime and the nighttime. Furthermore, it comes with a long battery life, which gives it an edge over all the other night vision scopes available. I was truly amazed by the performance of the price tag. It is very easy and simple to use. With a full moon, I could see well over a 100 yards without any additional Reticles. Its 4.6 magnification helped me to view my target clearly without any distortions. Comes with powerful magnification capabilities. Long battery life which allows the hunter to use it for longer durations. Very easy to carry and maintain because of its light-weight design. Easy to detach and reattach with the rifle. The controls of the vision scope are a bit stiff and hard to handle. This night vision rifle scope comes with spectacular magnification capabilities which enhances the clarity of your target you are trying to see. It is one of the top quality night vision scopes available for shooters and hunters. Look no further, simply grab this night vision for your next hunting trip and have an ultimate hunting experience. If you are in search of the top night vision rifle scope under 500-600 to enhance your hunting experience at night, Sightmark Night Vision Scope is the best option and is available here. With a powerful 5X magnification the Armasight ORION 5X gives you a brilliant precision, accuracy and stands at number 7 on our list. This night vision comes with a detachable IR810 infrared illuminator which helps you in having an optimal efficiency of the scope even in low and dim light conditions. Furthermore, the scope comes with an extraordinary and unique design for hunting enthusiasts to have an amazing hunting experience. Armasight ORION 5X comes with a 5Xmagnification power which makes it easier for the hunter to view his target. You will be able to enhance your long-range shooting skills with the help of this night vision scope. Because of this unique feature of 5X magnification, you are able to exceed ordinary levels of accuracy. If you are a hunting enthusiast who aims and shoots small targets at night, the powerful magnification of this device gives you an amazing experience. You can even hunt small turkeys and rabbits with it in low light conditions. Every hunter is aware of the fact that one needs to protect the night vision scope from water and moisture. However, this option has a water resistance capacity that makes it a better option over all the other night vision scopes. This scope has a unique design which makes it easy to use and handle. The scope comes with easy to use control functions that enable the hunters to take fast actions. Many hunters find it very convenient and easy to use because of its compact and sleek design. Look no further, if you are in search of the best night vision scope which is able to function efficiently without any complications. This vision scope is a great choice for you. Armasight ORION 5X is the best option for you if you are searching for a night vision scope which is handy and convenient. In addition, the device also comes with the best feature of a night vision capacity that allows you to see your target even in the darkest environments. › What do other people think about this Gen 1 night vision scope? I was looking for a budget-friendly and easy to use night vision scope, the Armasight ORION did not disappoint me and it meets all my hunting needs. Another customer says I am even able to hunt in the darkest areas where there is very little light with the help of this night vision scope. I am happy that I found this scope at a great price. Comes with a low battery indicator that alerts the hunter when to charge the battery. Detachable reticle allows you to have the best clarity of vision. Durable and very easy to maintain. This vision scope is a bit heavy and becomes difficult to carry. The control functions are a bit confusing if you are a beginner. It is the best Gen 1 night vision scope with its spectacular features of 5X magnification, water resistance capability, and amazing night vision capacity. It is an ideal night vision scope for hunters and shooters who are looking for the ultimate hunting experience. Stop search and grab the Armasight ORION 5X which is one of the top rifle scopes. It is available at an affordable price. The Armasight scope has secured a number 8th position on the list of the best night vision scopes with a variety of different features which makes it a very desirable buy for hunters. With features like an easily controlling system and the waterproof factor, this becomes a very attractive purchase that seems to be worth every penny. This scope is considered as the best gen 2 night vision scope because of its great features for a friendly price. The following are a few of the features that the users can enjoy this product. The lens of this night scope pulls the whole thing together. With up to 6 times the magnification and a 6.5 degrees FOV, the scope is perfect for hunters that have their target at a distance. The center is illuminated with a red cross to help you with the optimal contrast for the perfect night scope. The lens is multi-coated with IR transmission and is shockproof which makes it highly durable. The controls of this night scope make it one of the best gen 2 night vision scopes that you will be able to find. The setting and switches on the body are designed to be easily functional and easily understood which makes the usage much easier. The machine also has an auto bright control system that helps gain the user a better vision at night without any hindrance. The product is designed to easily mount on a standard weaver rail. It also has a waterproof body which allows the user to enjoy their adventures without having to be too careful of the water. You will also have the luxury of getting this attached to the standard weaver rail which helps you look without moving around and standing for a long time. It is also made lightweight for the customers to easily use. The warranty of this product is two years (can be changed as company policy) so that the customer can get full satisfaction from their purchase. However, the warranty is limited, and it covers only a few aspects. You will find this product to work great and at a good price. Features like being waterproof and lightweight allow the user to enjoy working without the worrying about these features while they are hunting. The added features of the lens make the scope much more attractive as a purchase. › What do other people think about this Gen 2 night vision scope? This scope is perfect. It works just as well in the day and even in the night. I found it to be very lightweight and convenient while just observing nature from afar. It comes at a very reasonable price which makes it much better. Magnification provided is about 6 times with a 6.5 degrees FOV. The brightness is automatically controlled with this scope. The machine is lightweight and easy to use. The company gives a warranty which makes it better. It cannot fit a camera. An external lens cannot be fit into the system. The Armasight night scope is a great purchase for hunters and people who generally just want to observe nature. It comes at a reasonable price which is great for a good lens like the one on this night scope. We highly recommend this product. You can check out this night vision scope for yourself with much more details here. This Armasight scope is ranked at the 9th position among the best Gen 3 night vision scope. The price may be on the higher end, but it is still a great deal. It easily fits on most rifles without causing an imbalance because of its weight and other factors. Aside from this, it has many great features that come with this scope. This Armasight is considered to be the best rifle scope which helps the hunters get the luxury of fitting it on the rifle with ease. The lens of this night scope has a 2.5x magnification without distorting the image to allow the user to target from a nice distance. The lens is multi-coated with an internally adjustable reticle which helps the user mark their spot easily and make a better shot. You will also get a 2.5 times magnification which doubles 5 times in a matter second for a better focus. The lens is also multi-coated with glass for clarity and durability. The body of this night scope is not only waterproof, it is sand and dust proof as well. This feature allows the users to use the night scope without having to worry about the weather conditions or without having to treat it carefully. The body is also made lightweight so that when it is mounted on the rifle, it does not become too unbalanced and can be carried without hassle. You can simply fit an illuminator on this scope to make it more efficient than it already is with targeting. If you would like to use the scope in the daylight, you can simply remove the illuminator and in the night you can attach it back for hassle-free usage. The machine does not use auto brightness settings; in fact, it uses the manual gain (MG) feature of controlling the brightness according to the requirements in the situations of the user. This feature allows the user to have a better image than the autofocus will bring. The Armasight Gen 3 scope proves to be the best night vision scope in its series because of the very carefully crafted features that make it better than its contemporaries. Features like the manual gain of controlling make the high price worth it. › What do other people think about this Gen 3 night vision scope? The only problem I had was the price was a little too high and I had a lot of questions. However, it was a perfect scope with a lot to offer. I love the product so much! The brightness and contrast can be controlled manually. The machine can be mounted on a weaver or even a Picatinny. The lens is a multicoated all-glass length for durability and clarity. The body is water, sand, and dust proof. Even though this product is a little expensive, it is still the best gen 3 rifle scope for what it has to offer. Great features like the IR illuminator and all glass lenses make the machine clear and better for the hunter at nighttime. You will find great price deals here that will make it a great option for you. Last but not the least. Number 10 place is secured by ATN ARES as the best gen 4night vision scope. The quality and features meet the expectations of customers and help to achieve a better target experience. There are several features which make this the best night vision scope of Gen 4. Each feature is carefully placed with the utmost advanced technology so that that it will be one of the better scopes. The lens is made from all-glass multi-coated optics which allow better clarity and fewer scratches on the lens over time. The lens also has a red reticle center which is illuminated so that the contrast is better and more visible against the target regardless of its light status. The accuracy of the lens is quite excellent. The brightness is automatically adjusted in various light presences according to the light contrast which shall make the vision better. Additionally, you will not have to control the system, again and again, to help find the right spot as the scope will do it for you in just a few seconds. Furthermore, the red on green reticle system allows a much-contrasted brightness system with 1/6 MOA adjustment. There is a total darkness illuminator of infrared in this night vision scope that provides a high definition image when you are hunting in total darkness. An additional IR indicator for low battery is also a great feature. Moreover, it runs on 2 AA batteries; you can carry with you as extras so that you never run out. The usage is made rugged and easy to use for the hunter’s convenience. With many of these features, you will find this to be the top quality night vision rifle scope lens. However, some parts may be fragile so you have a limited warranty for better customer satisfaction. This Gen 4 night vision scope is a high functioning and high definition scope which gives you clear vision even in the dark with its filmless technology. The auto contrast and easy magnification steps allow the users to enjoy hunting without a problem even at night time. › What do other people think about this Gen 4 night vision scope? This night vision scope is one of the best that I have owned. The high definition images and clarity make it a perfect to look through when going night hunting. I love it! There is an auto brightness and contrast setting option. You can see in complete darkness. Red and green system allow for a contrasted image. The body is not waterproof, sand proof, or dustproof. Even though this night vision scope is expensive, it still is one of the best ones available on the market. An entire showstopper, it is able to show HD images even in complete darkness. Check out customer reviews to see some genuine feedback and prices. ATN stands for American Technologies Network and is one of the most renowned brands in the manufacturing of good-quality NV scopes. Moreover, it has been serving in this field for more than twenty years. A worth mentioning characteristic of this brand is its wide range. They have a wide range of prices where you can purchase their least expensive devices with the basic features or you can also enjoy their extremely advanced expensive items. In short, this company provides devices for a variety of classes and uses. This company is also well-known in this industry for manufacturing NV scopes and thermal imaging items. It is also a leader in today’s many standard technologies. This company has started a while ago and it celebrates the crown of bringing R&D features tonight vision scopes. Their products also comprise a wide range of prices and features. You can get from least expensive simple scopes to complex expensive devices. It is a young company in the field of night vision scopes. It started back in 2009, yet with its quality products, it has won the trust of many customers. Furthermore, its scopes are particularly famous among professional hunters. Sightmark is also a newer brand and started almost ten years ago. By delivering a wide range of products, it is slowly gaining customers in the market. Much like Firefield, it also aims to provide quality products to people at affordable prices. It is one of the leading industries of sports optics. It has been serving customers for more than six decades. Furthermore, it aims to deliver good-quality, affordable, and durable optic goods for all types of outdoor activities. It also manufactures a wide range of night vision scopes. Getting the best night vision scopes may be a tricky task since you do not know what features to look for until you try it in the dark. Do not worry anymore! We are here to help you pick out the features that you should have in your scope. Ocular and objective lens are the two prime which contributes towards the maximization of the magnification factor. Field of view and resolution are the secondary factors. A large FOV enables you to see more without moving the sight. Whereas, the magnification allows you to control the zoom level. The clarity of the image depends upon the resolution. A high resolution makes the image clear and reduces eye fatigue. A low resolution will create a problem in identifying the target. The resolution is measured by line per millimeter for calculations. The higher lines, the better the vision will be in the dark. Something with 64 – 72 LP/mm is a great option for good clarity. You need to understand the fact that a night vision scope will have a lower range as compared to a regular rifle scope. Of course, you will want your scope to be of a higher range so that you can see from a greater distance and especially at night. However, the range of night scope has a subjective level and depends upon the availability of light. Many brands have mentioned the range under different conditions such as starlight, overcast sky or a full moon. The recognition range will determine the field in the availability of the natural light. Therefore, the greater the range, the less you should want. You should look for a technology match with your requirements. It will help you to offload unnecessary weight of your rifle. If you’re opting for off –hand shooting or brush hunting then the light weight is a plus. An infrared illuminator is almost essential because it helps in making the vision brighter and better. The illuminators do not have much range but they still play an essential role in helping towards a better performance. Of course, there are always a few essential additional features that you will want. Ideallythe , something heavy isn’t convenient. You will also want something with a waterproof body and a sand proof body. Don’t forget to look for secondary functions such as weather sensors, GPS, video output, or/and the ability to connect to a smartphone. Durability is one of the most important factors for customers that will be spending a great sum of money on these scopes. Multi-coated glass, strong body, and even a soft cover will provide a longer life for your scope. Buying an expensive scope means that customers want to go for the best offer. This option comes with a lot of questions from the customer. We have answered a few of them to the best of our knowledge for you to have a better buying experience. Q. Can I use the night vision scope in the daytime? A. Some night vision scopes are not made for daylight. In fact, the harsh sunlight can hurt the lens. If you want one that you can use for the daytime, make sure that it has features to support that. One of the main features should be that the lens is neutral and does not absorb much light. Q. 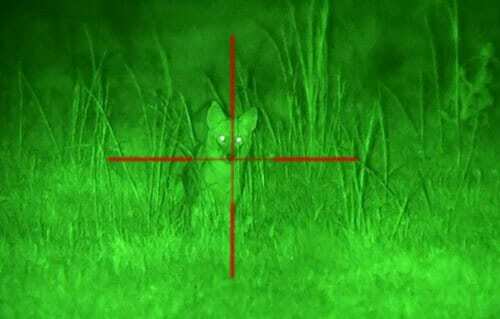 Why should you have a night vision scope for hunting? A. You can go hunting during the day by using only magnifiers. What about night hunting? It is an activity where you are going to have low to nearly zero light available. How will you spot your target? You will probably miss every shot. In order to get the right shot in a first attempt, you need the help of night vision scopes. Though there are many night vision devices available for hunting, this one is perfect for the job. It attaches to your rifle and gives accurate results. Thus, you can focus on your target rather than managing your devices. Q. Are there different night vision scopes for crossbows? A. You can use your night vision scope for crossbows as well without a problem, provided that your crossbow supports the mounting of the contraption. There are no specific differences except that you will need to make sure your scope is much more shock resistant when on a rifle. Q. How can I make sure that I see in pitch black as well? A. For the night vision scope, some natural lighting is essential, it can be as little as the moonlight in different phases of the moon. However, the very advanced ones have the ability to show you an HD image even in complete darkness. An illuminating IR light helps in creating an ample amount of light for the vision to be better. Every night hunter knows the struggle involved in spotting your target, objects are quiet, distant, and not visible during this time during outdoor activity. In order to handle this situation, the hunter needs proper tools and devices. There are many devices invented for this purpose. One helpful tool for many gadgets is the night vision scope. Anyone who invests in a high-quality pair of night vision scope will be very successful in catching their targets. Here we have discussed these scopes in detail. 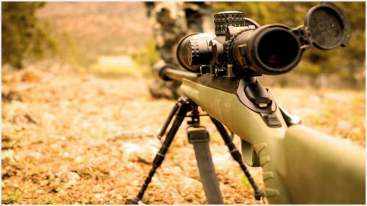 Reviews of the top 10 best night vision rifle scopes are also provided. The basic purpose behind this is to provide you comprehensive information before you select the right tool. After reading, you will be more aware of what the best option is for you. If you ask us to pick our favorite, we would pick the Firefield FF16001 NVRS Night Vision Riflescope. There are many reasons involved. One of them being, it delivers nice illumination and magnification features. Both of these features make it surpass other Gen 1 NV scopes. Another is that it contains all the basic features needed to offer great ease for hunters. The affordability is the cherry on the top. It is perfectly suited for anyone who wants to become a more accurate night hunter while also remaining in the price range.